Summary: A Lawrence County bar burns down. Station: WPXI Channel 11 Reporter: Jodine Costanzo When it Aired: March 22 Running Time: 37 seconds Visuals: Smoke, flames and fire trucks, after dark. Highlights: * When the station's male "power voice" presents this pithy preview: "Closing time comes early: The local bar burns." * When Costanzo offers the particulars: "The fire happened this morning at [this] restaurant in Union Township. About 30 people were in the bar when the fire began. Everyone got out safely. Within minutes, flames were shooting from the roof." * When Costanzo reports, "Investigators say the fire started near the kitchen. The cause has not been determined." What We Learned: Sometimes "last call" is 911. Unanswered Question: Isn't there an easier way to get stubborn patrons to leave at closing time? News Value: 0. A typically uninspired story, replete with the requisite "behold the awesome fire!" footage. Summary: A woman finally must leave her home because it's too dangerous to inhabit. Station: WPXI Channel 11 Reporter: Jodine Costanzo When it Aired: March 22 Running Time: 2 minutes, 14 seconds Visuals: * The words "Only on 11" on the top on the screen, which remain through the entire segment. * Gas workers outside the woman's home. Highlights: * When Costanzo reads, without wandering once from by-the-book TV-news anchor gesturing, "Sliding away: an 83-year-old woman forced to leave the home she loves. After two years of trying to stay in her house, the woman was forced out today. We were there as she left a lifetime of memories behind. A story you'll see only on 11." * When the crying woman struggles to speak, "This is terrible. ... I never thought it would come to this." * When an unflinching Costanzo -- in the newsroom and completely detached from the footage -- says, "A heartbroken [woman] watches from her front porch as the gas to her [home] is shut off. Sadly, it means this is moving day for the legally blind [woman], who's lived here for 36 years." * When Costanzo explains, "Her house is teetering on the edge of this hillside. The erosion [is] so bad, Equitable Gas has deemed it extremely dangerous, fearing a gas-line rupture. After battling this fight for two years, several neighboring homes have already been vacated." What We Learned: This may be one of the worst broadcasts I've ever seen, and it's not even sweeps month. Unanswered Question: Is that it? News Value: 1. The mean gas company forces elderly woman out of her home, and Channel 11 cares so much it was the only outfit to show you the tears, up close. Uh-huh. I have the greatest sympathy for the woman, but according to the news report itself, she knew for at least two years that this day was coming. And if your angle is "a woman is forced to leave the home she loved," you could at least get an anchor who can show a hint of emotion when reading the piece. Summary: Police attend a workshop on how to spot a drunk. Station: WTAE Channel 4 Reporter: Ari Hait When it Aired: March 23 Running Time: 2 minutes, 27 seconds Visuals: * A woman trying to walk along a line made of blue tape. * Coolers full of beer. 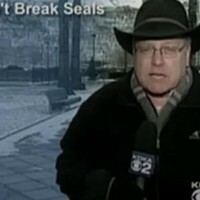 Highlights: * When anchor Mike Clark announces, "Pittsburgh's Police Academy looked more like a wild party tonight. People sitting around and getting drunk." Usually, people don't sit at wild parties, do they? * When anchor Wendy Bell follows, "This is all part of police training, though. Officers who run a sobriety check point need to learn how to identify a drunk person. And what better way to do that than with a drunk person? [Hait] has more from the party with a purpose." * When Hait reports, "This particular training starts with seven sober volunteers. ... But in order to help, they have to drink and drink and drink." * When a flushed-faced, giggling woman says, "I think though, maybe, they put colored water in the Captain Morgan bottle, because I really didn't taste it the first two drinks. But this drink is much better." * When Hait continues, "Two hours later, the volunteers are tested to make sure they are plenty drunk." * When the flush-faced woman proclaims, "Someone's pickin' me up, and then they're taking me out someplace else," and then bursts into laughter. * When Hait assures us, "[D]on't be concerned. That's the way it is for every volunteer here tonight. They all had to have rides home before we even got started." What We Learned: Some kinds of "volunteer" work are done more for yourself than for others. Unanswered Question: Is it really that difficult to spot a drunk? News Value: 4. If only officers could pull people over for driving stupid.